For years I have railed against the marginalization of history and the related social sciences, in The Source, in formal presentations, and basically, to anyone who would listen. (My apologies to those of you I’ve cornered more than once on this topic, especially the lady who cuts my hair and my mom, who really couldn’t find an easy way out of earshot). Although the context for each harangue changed, my central questions did not: How did the study of the history become so unimportant as to be dropped from the public school curriculum? Why would American schools suddenly stop teaching students how to think critically, argue persuasively, and analyze competing points of view? And why on earth would school leaders reduce instructional time for history, a text-dependent discipline, if they wanted to improve student literacy? Finally, given the fact that this marginalization is most pronounced in schools of color and poverty, what will be the impact on a democratic system dependent upon informed citizenry? We began to see this marginalization really take hold in California schools halfway through the last decade. By 2008 when we hosted a series of public conversations on the topic, entitled The History Summit, the desperation inspired by the increasingly harsh accountability measures based upon student performance on standardized tests in English and mathematics, hundreds of schools across the state, primarily in the elementary and middle school grades in communities struggling economically, had instituted daily calendars that reduced or eliminated history instruction all together for some or all of their students. 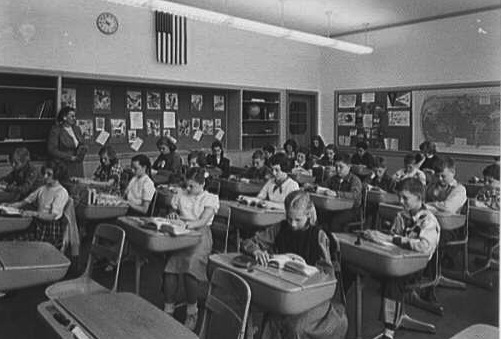 Teachers reported that their administrators forbade the instruction of American and world history (as well as other non-tested and therefore of “questionable value” disciplines, like the arts and foreign language). Horror stories began to emerge from the ranks of our elementary teacher leaders, who were now required to divide their day into two and one-half hours of English / Language Arts (mainly scripted lessons centered on simple narrative or fiction, interspersed with out of context vocabulary drills), two hours of mathematics, and an hour of physical education. The monotony of this approach drove the most determined teachers to subvert the process in the most creative of methods: carving out weekly history sessions in their calendars by hanging a “testing – do not disturb” sign on their classroom doors. That really was the low point, in my mind, of a system gone horribly wrong. I’m not trying to place the blame for the marginalization on any particular legislation, policy, or educational leader. I still agree with the broad goals of the standards and assessment school reform movement – providing equal access to students at every school and holding us all (teachers, administrators, parents, and community members) responsible for their learning. But in the zealous pursuit of that goal (and in a bid to avoid increasingly unpleasant accountability measures), school leaders made what is clear now to be terrible decisions. By focusing on the relatively narrow short-term goal of increased test scores in English / Language Arts and Mathematics, these leaders sacrificed some incredibly important long-term benefits, namely, the ability of their students to think critically, evaluate an argument, understand the history of our country, and participate as a citizen of our global community. I’ve been thinking about this a lot lately as we prepared this issue of The Source, focused on the new Common Core Standards, adopted by 46 states thus far, including California. As many teachers have already noted, the Common Core’s emphasis on expository text, its mention of specific historical documents, and the specific inclusion of a section dedicated to developing literacy in history or social studies, increases the importance of history in the public school curriculum. Clearly, this document still privileges the teaching of mathematics and English / Language Arts, but I can’t help but wonder if our discipline’s new tagline should become, “We’re number 3!” given the attention given to history. Obviously, I’m not so naïve to believe that the publication of this one document, even with its official stamps of approval from a variety of state and federal leaders, can completely reverse the practice of marginalizing history. But I’m optimistic. It seems like people are finally listening and understanding that the answer to low test scores in English is not to abandon a literate discipline like history. National leaders, including President Obama, are decrying the narrow curriculum. Even former Secretary of State Condoleeza Rice called for greater curricular diversity, citing the impact on our national security, in a report released by a task force organized by the Council on Foreign Relations that she and former NY schools chief Joel Klein co-chaired. The California History-Social Science Project supports the lofty goals outlined in the Common Core standards. We fully understand that there will be many barriers to its implementation in American schools, especially those here in California, given our ongoing budget crisis. We can’t help but be hopeful, however, that by bringing attention to the very skills that were lost in our recent national obsession with standardized tests of limited value, we can make things just a little better for all of our kids.